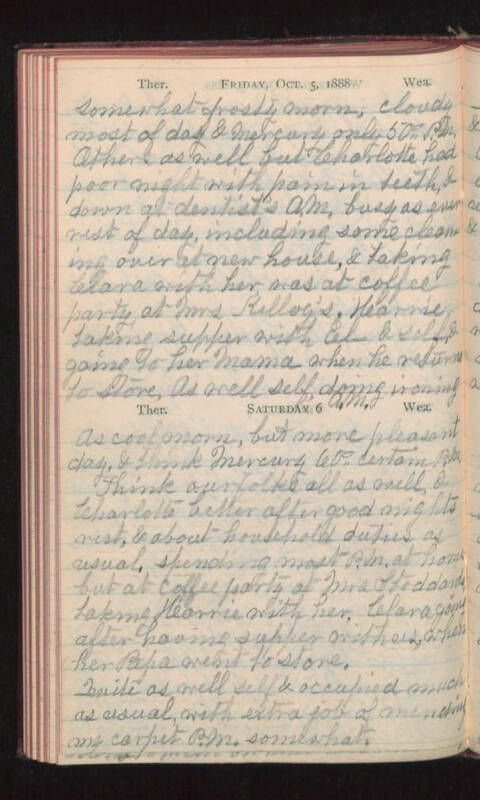 Friday, Oct. 5, 1888 somewhat frosty morn-, cloudy most of day & Mercury only 50° P.M. Others as well but Charlotte had poor night with pain in teeth, & down at dentist's A.M. busy as ever rest of day, including some cleaning over at new house, & taking Clara with her, was at coffee party at Mrs Kellog's. Karrie taking supper with El- & self, & going to her Mama when he returned to store, as well self, doing ironing A.M. Saturday 6 As cool morn, but more pleasant day, & think Mercury 60° certain, P.M. Think our folks all as well, & Charlotte better after good nights rest, & about household duties as usual, spending most P.M. at home but at coffee party at Mrs Stoddards taking Karrie with her. Clara going after having supper with us, when her Papa went to store. Quite as well self & occupied much as usual, with extra job of mending my carpet P.M. somewhat.